Pictured here are the two senior students at Margaret H. Rollins School of Nursing at Beebe Medical Center who have earned the new Beebe Medical Staff Nursing Scholar’s scholarship. They are: Alexa Baich, left and far right, Amy Cosgrove. 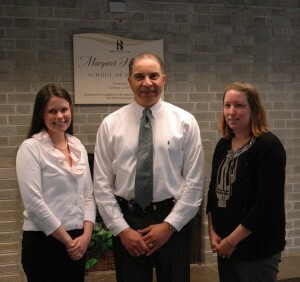 Pictured in the center is Medical Staff member and Lewes cardiologist R. Alberto Rosa, MD. The Medical Staff at Beebe Medical Center recognizes the support of nursing education as a very important component of its mission in the promotion and delivery of healthcare in Sussex County. The Margaret H. Rollins School of Nursing at Beebe Medical Center, formerly the Beebe School of Nursing, has a long and proud history and tradition of excellence in nursing education. It remains the only community hospital-based institution in the State of Delaware to continue to fulfill this mission. The Beebe Medical Staff created the Nursing Scholar’s program to support the nursing education of eligible candidates at the School, which includes the candidate’s expressed intention of working in our community after graduation. The Scholarship recognizes exceptional clinical performance in nursing, in accordance with the criteria established by the Students Services Committee of the School of Nursing. Two senior students are the recipients of the scholarship this year: Alexa Baich describes herself as a native Sussex Countian and lives in Rehoboth with her husband and daughter. She wanted to attend the Margaret H. Rollins School of Nursing because it offers a challenging, hands-on experience and because she wants to be the best nurse she can be. Becoming a nurse is a second career option for Amy Cosgrove. Amy enjoyed her clinical experience in the Women’s Health unit at Beebe Medical Center and hopes to earn a Bachelor’s degree in Nursing and to become credentialed as an obstetrics nurse. Both Alexa and Amy have worked as Nurse Techs while attending the School of Nursing.